Open daily 9 a.m. to 5:00 p.m. The Garden Gate Shop stocks the finest home furnishings, plants, books, and garden accessories. Whatever your gardening or gift needs, you'll find lovely items for home and hearth, patio and picnic. 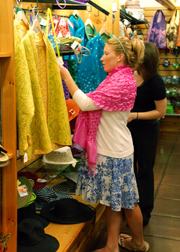 Members receive a ten percent discount on all merchandise in the Shop, with seasonal sales of up to twenty percent off. All proceeds benefit the Garden, so visit today! Beginning September 2016: New Gate Shop Rewards Card! Receive a card punch for every $25 you spend in the Gate Shop. Once your card has 10 punches, you earn a free gift—any item in the Gate Shop under $40! Completed punch cards are entered into a quarterly drawing for a chance to win even more. Earn double card punches during select member events. Members at the Individual through Friends & Family levels save 10% off all purchases. Members at the Festival level and above save 20%. On the first Friday of the month, members "double the discount" for a total savings of 20%. Members who regularly save 20% will receive double card punches. No cash back on free item. No additional discounts (member or otherwise) on sale products. Only purchases at the Garden Gate Shop count toward your rewards card. Purchases cannot be combined to redeem a $25 punch. Punches can only be redeemed at time of purchase.